The Taoiseach has led the tributes to the Irish rugby team who have won the Six Nations grand slam for the first time since 1948. The final score at Cardiff's Millennium Stadium was 17-15. Tries from man of the match Brian O'Driscoll and Tommy Bowe, both within six minutes after the interval, put Ireland on course for victory. 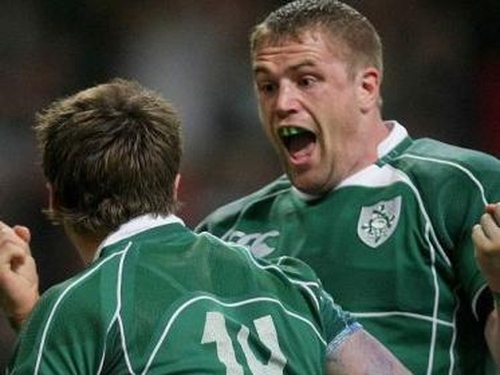 Irish fly-half Ronan O'Gara dropped a goal three minutes from time give Ireland the lead. A last minute penalty for Wales shredded Irish nerves, but Stephen Jones's kick fell short. Speaking after the game, Captain Brian O'Driscoll said he delighted with the win. The Taoiseach said it was a privilege to be in Cardiff and witness the team’s remarkable determination and will to win. Mr Cowen said: ‘It has truly been a most memorable season in Irish rugby history and great credit is due to the Coach Declan Kidney, Team Captain Brian O'Driscoll and the entire playing squad’. The Minister for Sports, Arts and Tourism, Martin Cullen said the team was deserving winners of the highest accolade in northern hemisphere rugby. President McAleese, who attended the game, said the country should be proud of the team's historic win. Fine Gael leader Enda Kenny described the result as a magnificent achievement saying it was truly a day ‘when you can be proud to be Irish’. A civic reception for the team is to be held at the Mansion House in Dublin at 4.30pm tomorrow.